Brora distillery is known and appreciated in particular by collectors. It’s a Highland distillery that was closed in 1983, during the great crisis of Scotch whisky. The remaining stocks have been stored for years by Diageo, the owner company, which has decided to put on the market limited annual editions. In this case, some 1977 casks have been united to give life to this 35 year old. It was the twelfth edition, released in 2013, and which from the moment of its release has seen the price increase steadily and today it exceeds 1.500 euros. Nose: the remarkable complexity is immediately noticeable. Notes of wax are outlined, followed by unripe red fruits and coconut. Also sweet peat notes can be perceived. Despite the long aging it is fresh. Notes of sandalwood are perceivable, followed by citrus, lemon in particular. By leaving it in the glass for a while, it reveals hints of freshly cut grass, which we have seen in some younger Clynelish. By adding a few drops of water the “farmy” sensations slightly increases. Palate: intense. Saline and mineral, with tips of white pepper. The peat is evident, followed by citrus jam (lemon, citron and orange). The intensity is excellent. The mineral part is predominant. With a few drops of water the fruity part emerges more: yellow fruits, with a good acidity. Then wood. Finish: long persistence. Unripe red fruits and wood are perceived, together with licorice and cappuccino. It continues on peat and spicy notes. 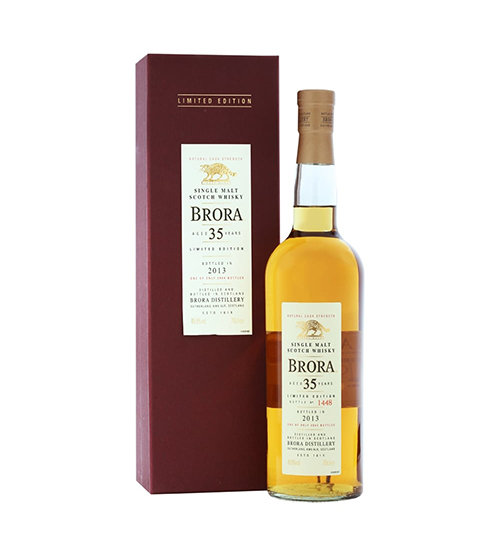 The Brora 12th Release 2013 is a high quality product, for a distillery that now belongs to the past. Its myth is supported by gems that keep the brand alive, just like this bottling. The balance between the various notes is excellent, as is the complexity and intensity.